From the writer/director behind the potent war film, Days of Glory, comes another historically accurate action film. With Days of Glory we were given the realistic depiction of Algerians who joined in the battle against German invasion. Unfortunately, what the Algerian soldiers soon discover in their effort to free France, is that there is a clear discrimination in the treatment of soldiers. Even though they are able to fight alongside the French, the North African soldiers are often demeaned, insulted, and aren’t even given the same meals. Willing to die for France and unable to eat the same food as the French, this struggle is as prominent as the struggle against Nazi oppression in Days of Glory. Rachid Bouchareb continues his theme of French oppression of the Algerian people with a film which brings us into the fight for Algerian independence from France years after the end of WWII. 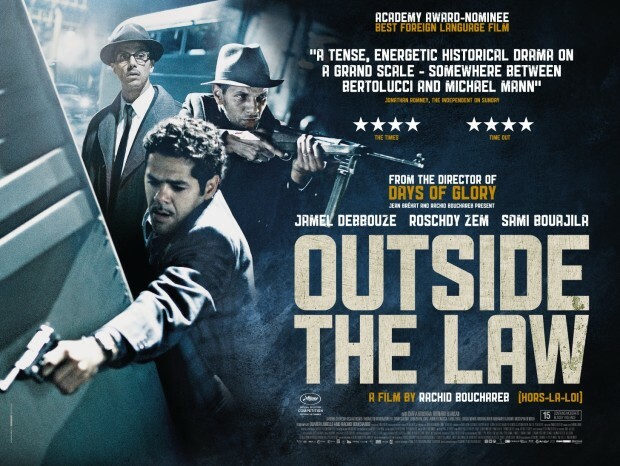 Three brothers take different journeys after they are kicked out of their homes in Algeria during French occupation, though each eventually come together to see one common goal for their countrymen. The different journeys allow them varying experiences and unique contributions to the resistance effort. Messaoud joins the French army fighting in Indochina, returning with a special gift for killing that he desperately wishes to have left behind. This is a life which is not allowed by Abdelkader, the brother whose time in prison awakens him to the Algerian independence movement. Youngest brother Saiid moves to Paris to make a fortune, and does so mostly by living a corrupt lifestyle. All three have different paths, but they each come to together because of the blood they share. Agree or disagree, they are there for their brothers when it matters.